Her downcast chin and look is so very Díana and William. She’s the only one with an “it” factor. Neither William or Harry have it. Mia tindall might. I think Savannah Philips has it too. I don't know who she takes after, but she's darn cute! With the BRF it’s always the women that stand out so it’s not surprising that Charlotte is a little star already. Mia too but for obvious reasons we don’t see her as much. George and Louis are cute too though. On a recent outing to discount store The Range with both her older children, Kate was overheard chatting to little Charlotte and using the sweet term of affection. Fellow shopper Sarah Daniels, who spoke to the Daily Mail about the moment, said that at one point, Charlotte was sat on the floor in the shop - prompting the Duchess to tell her: "Get up, poppet." Adorably, Prince William has been known to call his wife the nickname, and Kate has been overheard referring to Prince George as 'poppet', too – so it seems it's a popular family term. People reports that Charlotte has been taking weekly private ballet lessons at a dance school in south London. The youngster has been practising her pirouettes and pliés at the school for several months now. 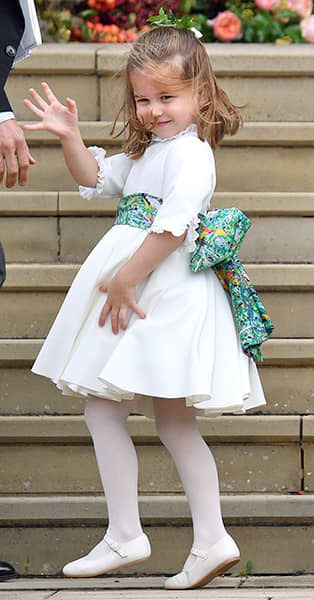 Kids dancing is always so cute to me, I bet Charlotte makes a wonderful ballerina, though I hope the discipline of it doesn't remove her sass and personality! Ballet is becoming more and more popular with athletes...a fair number of pro footballers already take lessons to cross train.